Steven Kasher Gallery is proud to present the first New York exhibition of the photographs of Peter Beste, in celebration of the launch of his first book. The exhibition will feature over 30 color and black and white prints, curated by Johan Kugelberg. In the last two decades a bizarre and violent musical subculture called Black Metal has emerged in Norway. It has its roots in a heady blend of splatter movies, heavy metal music, Satanism, Pagan mythology and adolescent angst. In the early-mid 1990's, members of this extremist underground committed murder, burned down medieval wooden churches, and desecrated graveyards. What started as juvenile frenzy came to symbolize the start of a war against Christianity, a return to the worship of the ancient Norse gods, and the complete rejection of mainstream society. American documentary photographer Peter Beste has spent the last eight years working in the milieu of this insulated and secretive community. Beste's access and insight into this community has been without precedent, resulting in an amazing photographic journey. Beste has earned the respect and trust of this impenetrable, suspicious and often elitist society. 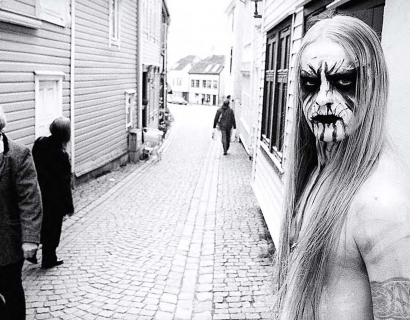 True Norwegian Black Metal is a visual testimonial to this subculture. Peter Beste and editor Johan Kugelberg have created a unique photographic narrative that explores black metal from a truly visceral perspective. May 9 through June 7, 2008.